Chiappera is the last inhabited hamlet of the Maira Valley; it’s located at the end of the road that goes from Dronero to Chiappera along the Maira river and divides the Valley into two. The Maira Valley belongs to the set of valleys surrounding Cuneo, which connect the latter with the alpine crown at the border line between France and Italy. Chiappera can be reached from Cuneo by car, by public transport means, with the Sherpabus mountain taxi (upon reservation and at charge), on foot or by bike through the “Percorsi Occitani” (Occitan Paths) itinerary. When leaving Cuneo you have to cross the Stura river on the “Viadotto Soleri” bridge of Cuneo, then keep on going directed to Caraglio – Maira Valley on the SS.22 road. As you reach Caraglio through the SP.422 road you proceed directed to Dronero. From Dronero the SP.422 reaches Acceglio and then it becomes SP 263 till it ends in Chiappera. The Benese bus company carries on regularly scheduled routes towards the Maira Valley, in particular to Acceglio (the bus end of line). 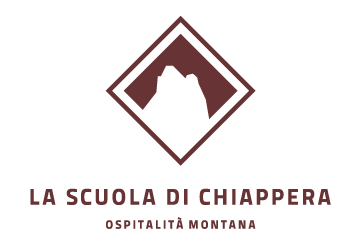 To reach Chiappera from Acceglio it’s adviceable to turn directly to the School of Chiappera staff and ask for being privately picked up at Acceglio. The Maira Valley is well served by an alpine taxi dedicated to all hikers. The Sherpabus is a luggage transfer along the Occitan Path, the G.T.A. tracks and all itineraries that end in neighboring valleys. Moreover, it can also provide a real taxi service (upon reservation, at charge).